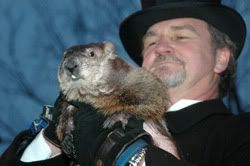 I don't think I ever knew his full name, but yep, that's the groundhog. Did you know he has his own site? Yeah, me neither. And here's Phil's official forecast (originally in"Groundhogese"(a language only understood by the current president of the Inner Circle) according to the website).